Yarrow is an aromatic perennial herb with tough stems and fine, feathery leaves that can grow up to 40cm in height. Yarrow produces flowers from early summer until late autumn in colours white, cream, pink, & red. The pretty flowers last well in a vase. The plant originates from Europe and western Asia where it grows wild on slopes, embankments, hills, mountainsides and along roadsides. It needs well-drained soil and although it likes full sun, it can tolerate light shade. 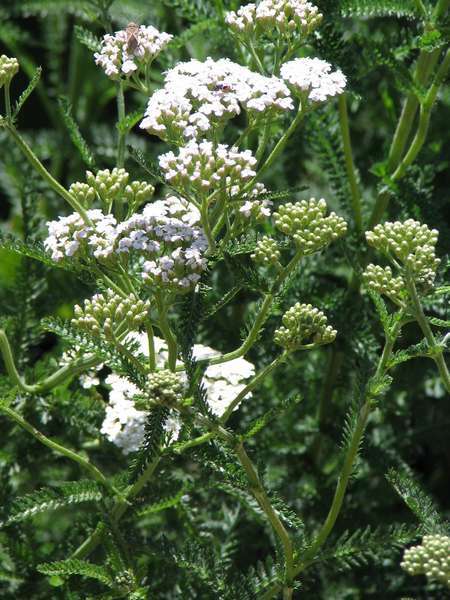 Yarrow is hardy and drought tolerant. It is not suitable for growing indoors. In hot, damp conditions Yarrow can be prone to mildew. It spreads by root, but not as vigorously as a mint. It needs to be lifted, split and replanted in well composted and fertilized soil every 2 to 3 years. Yarrow flowers attract beneficial insects like hover-flies, ladybirds, and parasite wasps that prey on garden pests such as aphids. Yarrow leaves are an excellent compost accelerator — the addition of just a few Yarrow leaves when setting the compost heap will speed up decomposition. The Yarrow plant is rich in copper, which is an indispensable constituent of all living tissue, and Yarrow leaves can be infused to make a non-toxic copper rich foliar spray for controlling fungal growth and downy mildew on other plants. The leaves and flowers are cut in summer, when the flowers are in full bloom, and dried for use in infusions, liquid extracts and lotions. Small, fresh young yarrow leaves have a light, spicy flavour and can be added sparingly to salads. Yarrow has a long history as a wound healer and was known as “herba militaris” in ancient times because it was used to staunch bleeding war wounds. Crush Yarrow leaves to release their tannins and apply them as a paste to stop a bleeding wound. Yarrow leaves can be used externally to stop nose bleeds, and to heal skin ulcers. Yarrow leaf is rich in vitamins and mineral salts. It is a bitter, astringent herb that reduces inflammation, promotes perspiration, is anti-pyretic, relieves digestive discomfort and is a good diuretic. Yarrow lowers high blood pressure and relaxes peripheral blood vessels. Yarrow can be taken to treat feverish illnesses (colds, flu, measles), to reduce catarrh and relieve sinus congestion, for asthma, diarrhea, dyspepsia, rheumatism and arthritis. It is also a restorative herb for the menstrual, urinary and circulatory systems. A strong Yarrow infusion can be added to the bath water to treat pelvic autonomic dysfunction (painful cramp like conditions of the lower pelvis in woman), and for a sitz baths for hemorrhoids. Always remember that the prolonged use of Yarrow may cause an allergic rash. Place the herb in a container with a lid. Pour the boiling water (just off the boil) over the herb. Cover and stand for 5 minutes, then strain. Add sugar or honey if necessary. Use as a drink, taking 1 cup daily — or in chronic conditions, 1 cup every alternate day, hot or cold (per advice of the doctor or herbalist). This method of making an infusion can be used to make a tea from the aerial parts of a herb (leaf; flower; stem) or a mixture of these, but not when using the roots of a herb.